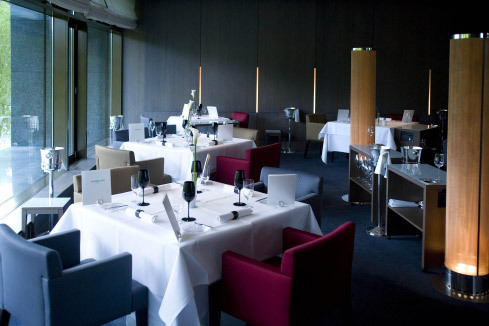 His first commis post was in the Rheingau at Gutsschänke Schloss Johannisberg where Dieter Biesler was chef de cuisine. Biesler is an institution among German chefs having worked as chef de cuisine in the Restaurant Walterspiel (the one Walterspiel I was talking about here). Sadly, he closed his Weinstube Biesler in Hannover end of 2008. For Elverfeld this first post was clearly a stroke of luck as Biesler is re-known for superior craftsmanship in cooking, excellent product know-how and a dedication to perfecting traditional and rustic dishes. So Elverfeld underwent a really solid further development of his cooking skills. 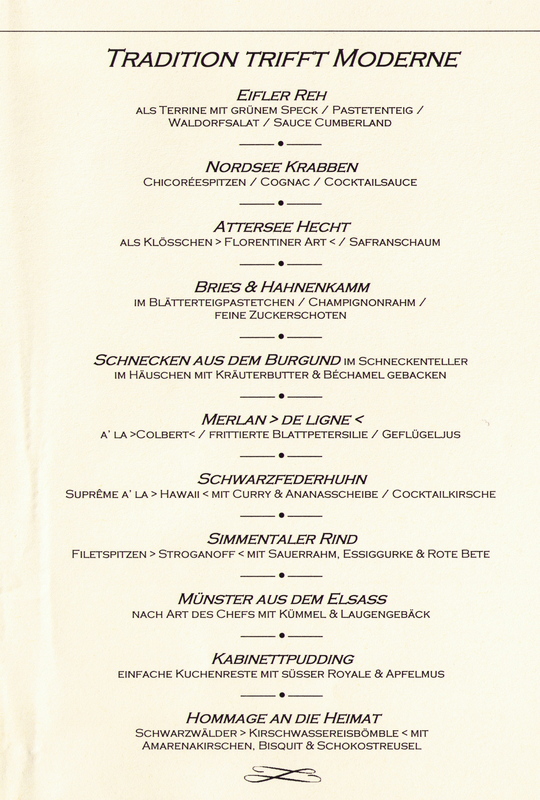 Another classic master, Willi Tetz, followed in the legendary Humperdinck in Frankfurt (one of the first fine dining places in town besides the Brückenkeller). 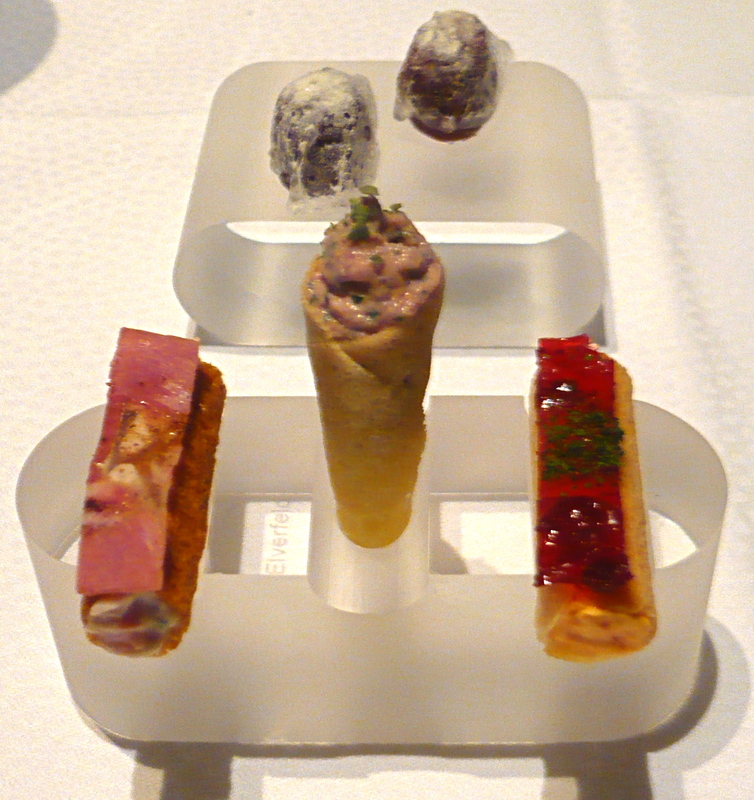 Enlightenment, the interest for Haute Cuisine, for the truly special moments on the plate came at Dieter Müller. Quite a stretch coming from Bielser and Tetz but Elverfeld could build on his superior technical skills. Three years in Lerbach from demi chef to chef de partie were formative and also some kind of burden for his development as it took some years to really emancipate himself from Müller’s style. On his way Elverfeld worked in Kreta, for Katherina Hessler back in Hesse, in Dubai at the Ritz-Carlton before he became chef de cuisine at the Aqua in the Ritz-Carltron Wolfsburg in 2000. First star in 2001, second in 2005 and finally the third in 2009 together with 19 points in the Gault Millau. Designed by Andrée Putman the Aqua is truly modern but time-less in a way – still young and fresh after nine years. Especially at night the mood is quite inspiring when looking at the old lighted VW powerhouse (besides the 40m pool on the small lake they recently build an outside spa). The festival kicks off with Knusperillos which are frequently new interpretations of German classics – the caramelized Kalamata olive is certainly not to top in flavour intensity. This is a kick-start to your palate engine – similar as the infamous szechuan button reset of Juan Amador (missing on my last visit there now that I think of it). On the forefront the confectioner shows – just look how filigree the work is with utmost care to small details: Preßsack red/white (a terrine of pork’s head), a cornet of slightly marinated liverwurst (how yummy) and the Bavarian specialty Obatzda (Camembert mixed with butter and onions seasoned with red bell pepper, caraway and salt – the most important bring-along in a beer garden). 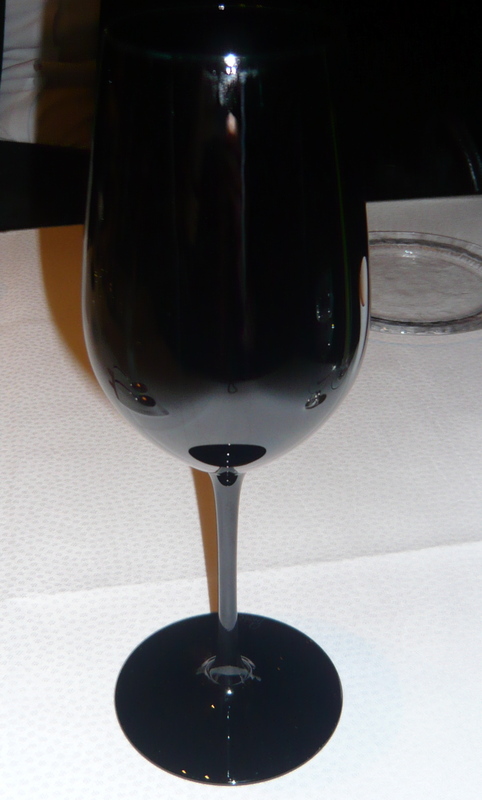 By the way, Elverfeld has designed the acrylic tableware himself. 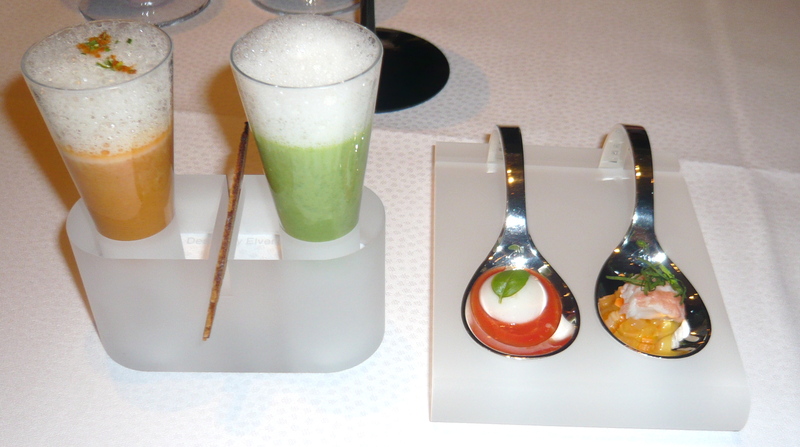 The second ‘amuse’ is always soup and spoon degustation. The soups are maybe the very last sign of Dieter Müller as Sven Elverfeld clearly carries on the tradition of very intense and spot-on soups without too much cream, here a a slightly spicy onion soup with sobresada air and creamy field salad soup with potato air. On the spoon Insalata Caprese in textures and crayfish with pataya-mango, vinegar carrots and garden sorrel. A perfect and delicious ouverture! 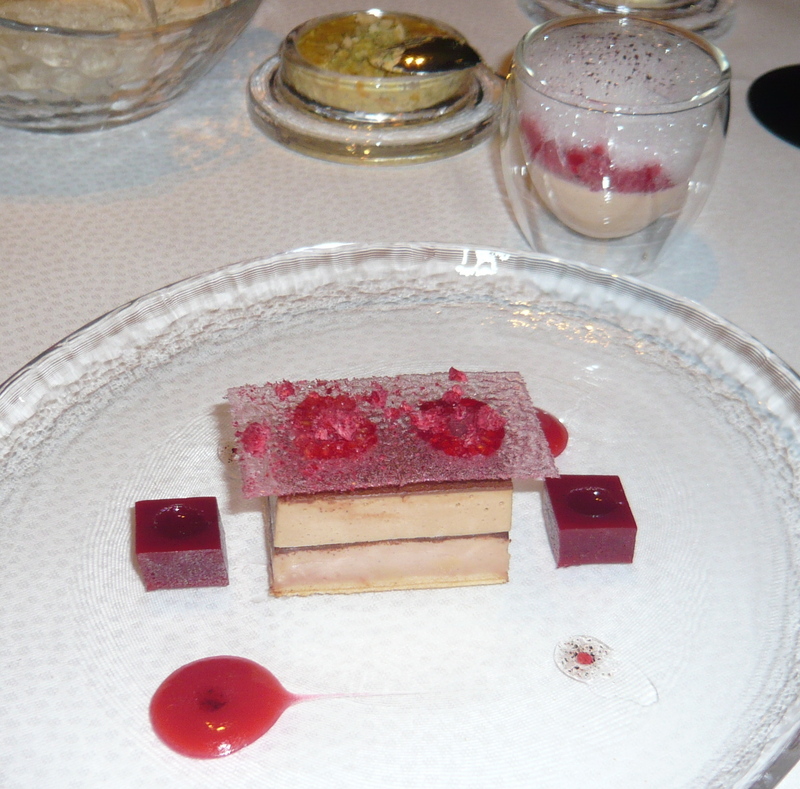 First course: gateau of foie gras with raspberries and Tasmanian pepper. Rightfully a dish from the Impressionen menu as I had a former version of it in November 2007 but without the intensive crème brulée, served with raspberry granite and vinegar air. This second element made this dish extraordinary – in itself it was rich and succulent, sweet and acidic, a true masterpiece. Interestingly, back then, when I ate only the gateau there was missing something. Somehow Elverfeld found the missing piece: it brings the necessary depth (yes, yes, I like that) to the interplay of various textures and flavours in the forefront. A truly remarkable further development and already kind of a signature dish… Excellent. Fantastic pairing with the Muscat from Tschepe as it has just the right amount of sweetness and acidity to stand the sweet-sour interplay of the dish itself. Next up was a new approach towards serving Brittany sardine: marinated sardine with potato-lettuce, tangerine and speck – interesting and new enough to be on the Visionen menu. Looking at the plate you can almost feel the suspense coming up as the combination is more than unusual. 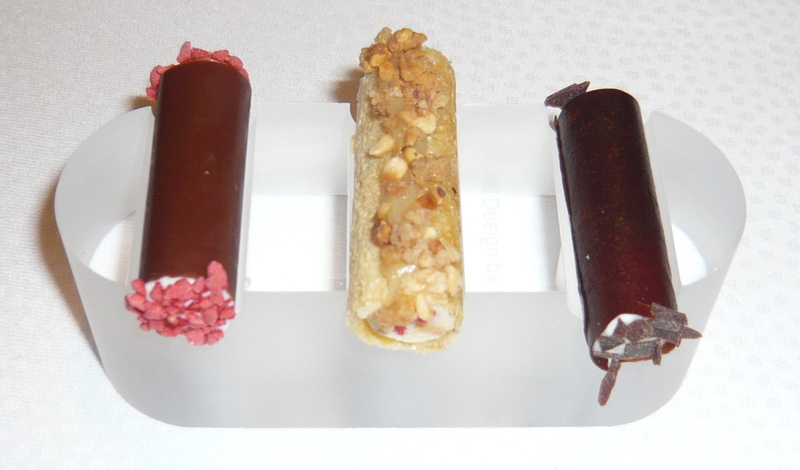 Again, you can grasp that Elverfeld had been trained as a confectioner as it shows in the plating. Elverfeld had served sardine with Abate Fetel (a very special and intense pear variety), eggplant and smoked paprika which worked similarly but this was much richer and more accentuated in flavour. 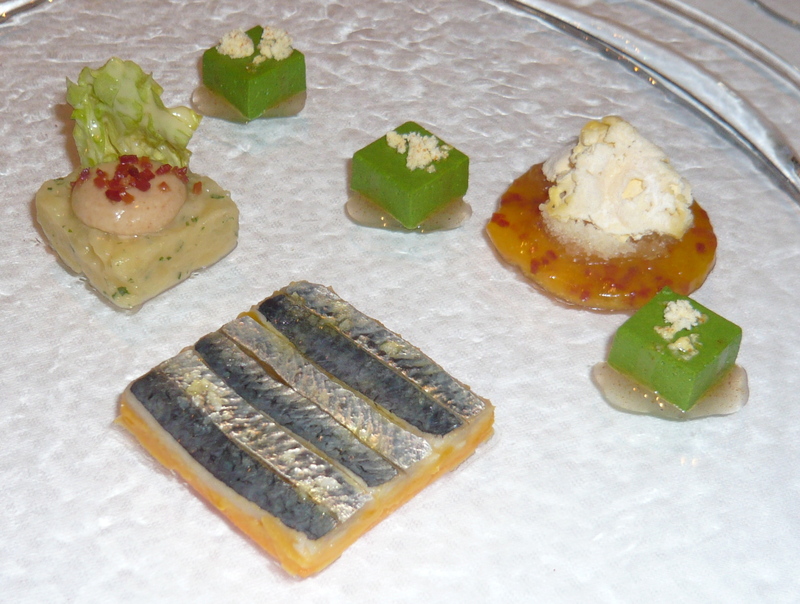 As before the sardine fillets are marinated with fish broth, oil and vinegar and cooked at low temperature (58°) but now served on a compote of sweet potato with tangerine pieces inside, warm potato salad with bacon (speck) espuma on top, lettuce jelly and a almost liquid jelly of tangerine with small pieces of bacon inside. On top of the tangerine jelly there is bacon granite (as on the lettuce jelly) and popcorn of tangerine oil (made by using liquid nitrogen). The harmony of the various elements was astonishing – you can’t go wrong in combining them, it always creates a wonderful accord. Interestingly, the smokiness of the sardines is repeated and the modified by the speck and the tangerine has exactly the right amount of sweetness to balance the more rustic lettuce and potato salad flavours. The textures are also noteworthy as there is no real crunchy element (like the usual chips of some fried something) but the small bacon pieces are a sufficient bite. 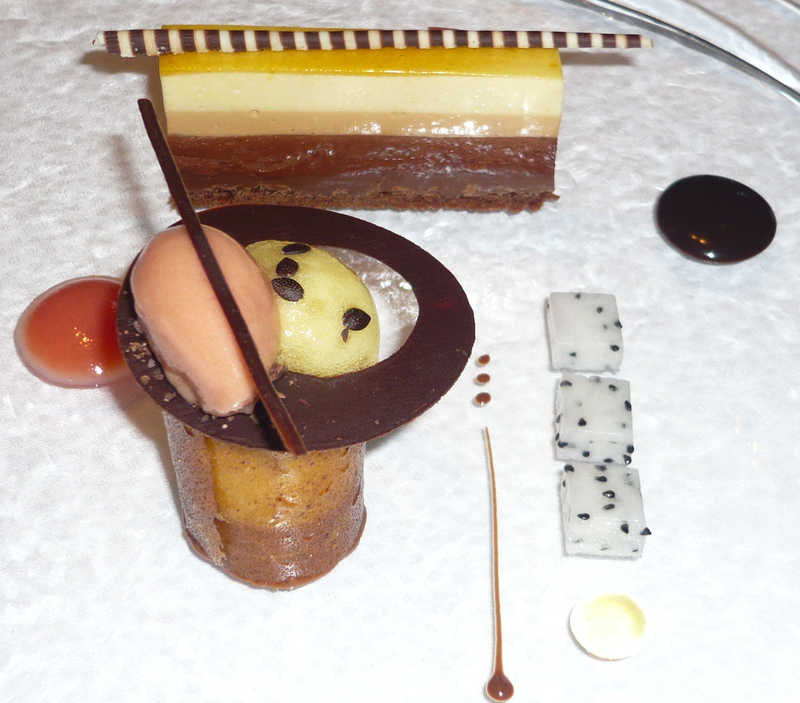 Oh, and the combination of tangerine and sardine as well as the contrast in temperatures worked really well – ingenious! A truly outstanding dish! Although I am not a big fan of Rieslings from Baden (I prefer the ones from Palatinate / Pfalz as there are more fruity) the Stigler had enough minerality, fruitiness and acidity to literally dance with the dish. Time for the first departure of our meal as I received the Yellowfin tuna ‘sous vide’ with black garlic (Visionen) and my companion got Orkney salmon & kohlrabi with rhubarb sweet-sour (Impressionen). Never had a tuna cooked sous vide before but the result was really convincing as it kept the moisture without being too rare what you normally get if you slightly roast the tuna on every side. So tender, juicy and delicate the main product really shined and created a nice contrast with the fresh and iodic algae. 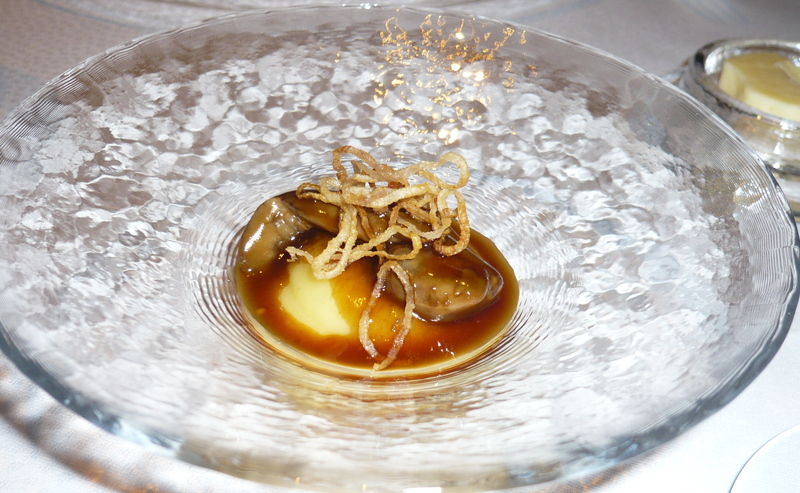 Japanese black garlic is fashionable these days as I had it in Berlin, Schloss Berg and recently at Amador – Elverfeld’s approach is different though – he serves it as in oil-like consistence and thus the essence of the sweet-sour flavour becomes emphasized. Pak choi (between the algae and black garlic cream) is the green vegetable backbone of this dish. Excellent! Viognier is always difficult to combine as it turns out to be rich and oily – but the one from Kleinood (nice name!) was not that dominant and really accentuated the sweet and sour flavours of both dishes. The salmon was incredible – perfectly cooked sous-vide having a benchmark salmon taste, natural fish flavour, meaty, but not fatty or fishy. More on the subtle side this dish was a perfect opener for spring, light and delicate. The rhubarb sweet-sour is a frequently used element of Elverfeld and adds freshness and intensity to the balance the more rustic kohlrabi and salmon. Outstanding! 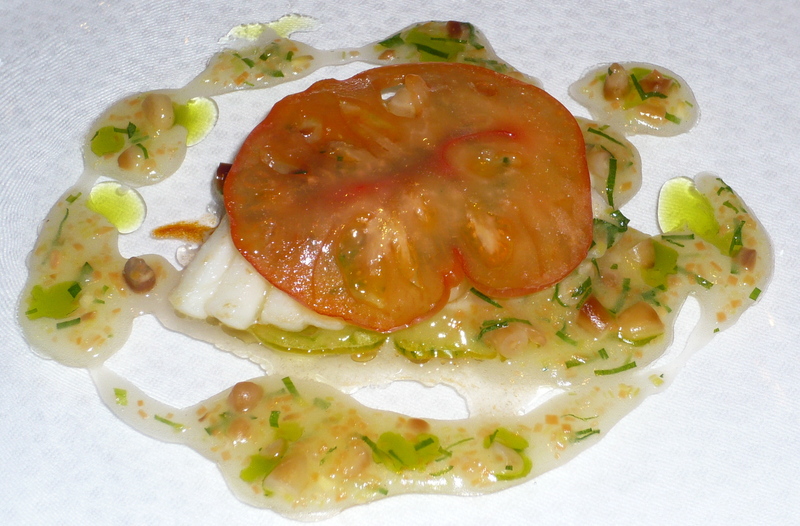 Next up was rouget barbet & veal sweetbread ‘à la Grenobloise’ with parsley, capers & finger limes (Visionen). 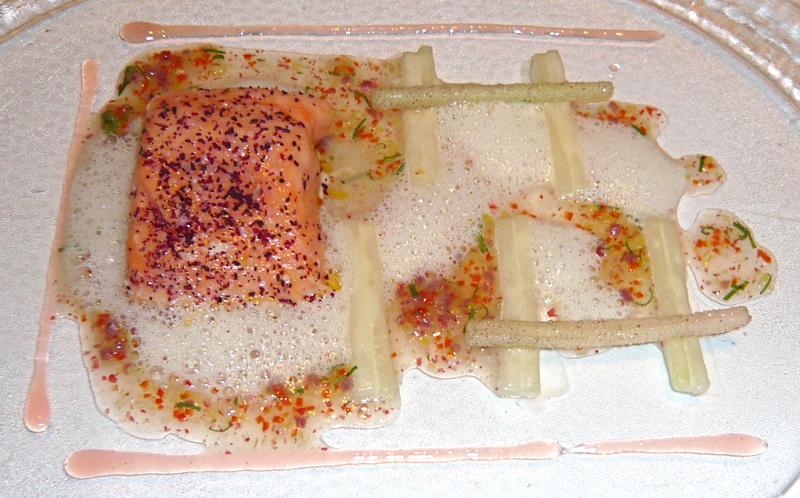 One of Elverfeld’s key themes is to modernize ‘classic’ dishes (like his cod with mixed pickles or the sole Finkenwerder Art). ‘A la grenobloise’ is a classic french recipe serving fish with brown butter, capers, lemon and parsley – all these elements are also present in this new and immensely lightened version. Eating it creates some kind of deja-vu of fond childhood memories when I ate this in the south of France. 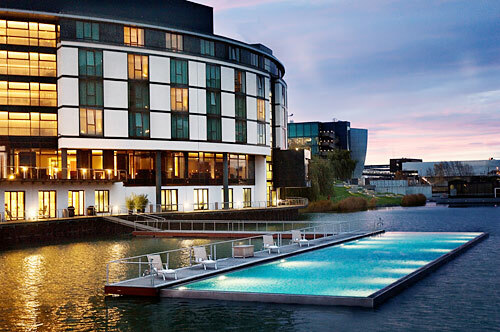 And, the trick is that Elverfeld appeals to your imagination in reviving and modifying your precious memories. Hard to describe as it is both known and unknown, security and insecurity on one plate. Both the finger limes (as the lemon element) and the brown bread crumble together with some caramelized scales on top of the rouget made this really special. Excellent to outstanding! Our next wine is typical for Jürgen Giesel who always searches for unknown and also exotic wines, especially from Greece and Hungary. Assyrtiko is a auchotone grape from the volcanic island of Santorini and has a fresh lemon and mineralic taste. Due to the Barrique oak notes the wines is strong enough to stand the next two courses. Evharis is said to be one the best producers of this wine. Another excellent choice! 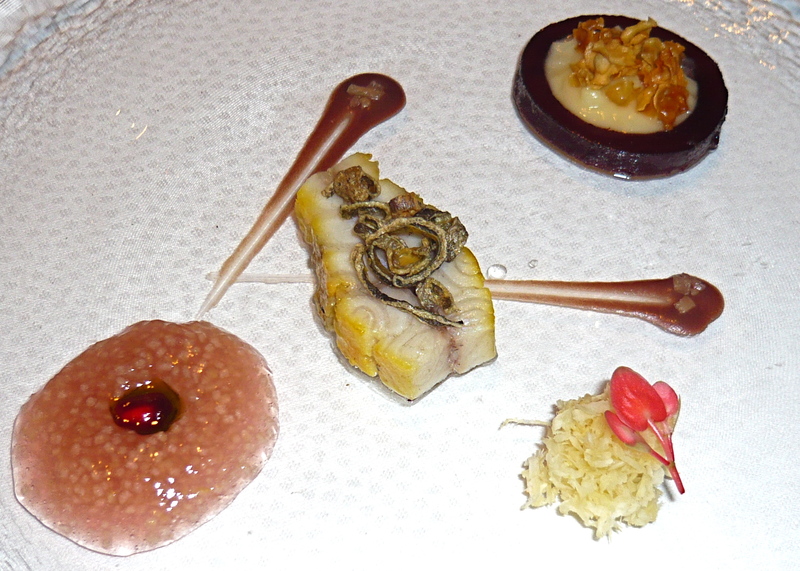 Next for me was warm smoked eel with boskop and parsnip, eel liver ‘Berliner Art’. Another stunner – especially for me as I loved liver in my youth (maybe I am a rare species) served with potato puree, roasted apple slices and onion rings (well, to be honest I left out the apple and onions quite often). Well, it wasn’t eel liver I have to admit but this is once more a playful appeal to vivid memories. You can be sure it takes some eel to yield that large liver, and it is not cheap (truly a luxurious product).The taste is like a very good veal liver but cleaner / purer and not fish-like at all. The dish as a whole was just delicious even despite the fact that I am not a big fan of eel (remember the famous eel scene in The Blechrommel by Volker Schlöndorf?). Really a complex construction but easy to comprehend and yummy in the end – excellent! 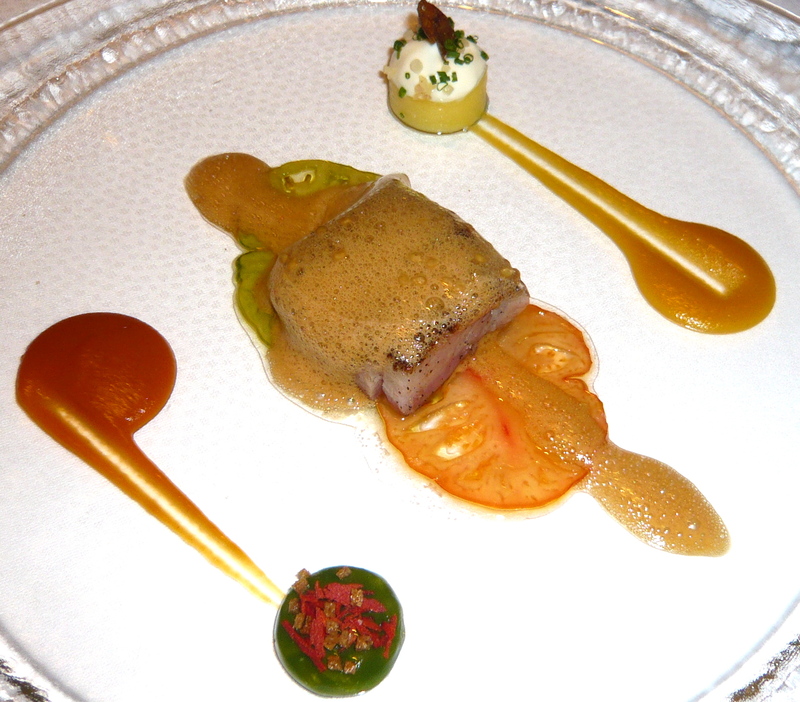 The highlight of the meal for me: Garimori pork ‘Secreto’, charcoal-grilled with Andalusian tomato red/green (Impressionen). Garimori is one of the finest producers of Iberian pork and it really is fantastic – real pork taste but not too pronounced, incredibly tender and juicy – wow. Perfectly grilled, the charcoal flavour gently kissed the Secreto and refined it. Together with the different intense tomato preparations, the potato/sour cream combination (hello, my dear fellow steak house visitors 😉 ) Elverfeld has created a truly memorable dish! 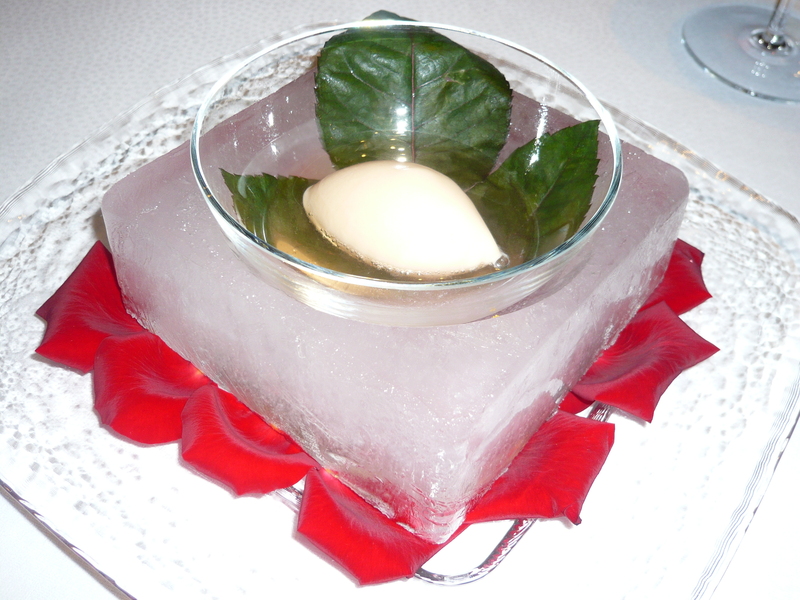 Instead of a spare plate for my companion – the infamous sorbet… Well, sorbets before the main course are somewhat in discussion recently – but I like them as an refreshing element if they are not too sweet or sour. The Champagne créme sorbet “Grand Vintage 2000” Moët & Chandon surely qualifies for being on the list of simply delicious and perfectly made sorbets, a nice palate cleanser and still up-to-date. Boeuf Stroganow (Visionen) – again a reinterpretation of a classic dish: Elverfeld uses a fillet from Simmental which is more subtle than Argentinian or US beef and much different than my recent Wagyu or Kobe experiences. Its aromatic and fresh taste stems from the herbs on the alp meadows and it is simple delicious. In the reality at Wolfsburg, all traditional Stroganow ingredients (beetroot, cucumber, mushrooms, sour cream) are deconstructed in a structuralistic way to include various textures and forms. It is not only playful but it also works, especially the nice contrast with the frozen and then melting sour cream which adds another dimension to this dish. On the side the Stroganow was accompanied by a nice beef ragout covered with an intense and to-die-for jelly of beef broth and a touch of beetroot – this was again the rich element providing depth and elegance. Outstanding again – my number two dish on this very evening! Young patissiere Nadja Hartl does a brilliant job and seamlessly integrates fantastic desserts onand the same level – somehow a continuance of Elverfeld’s subtle, playful and structuralistic cuisine. The Amedei chocolate ‘Exotic’ was a nice declination of different chocolates in different textures and refreshing exotic fruits like coconut, passion fruit, dragon fruit and a perfect guava sorbet. Excellent. 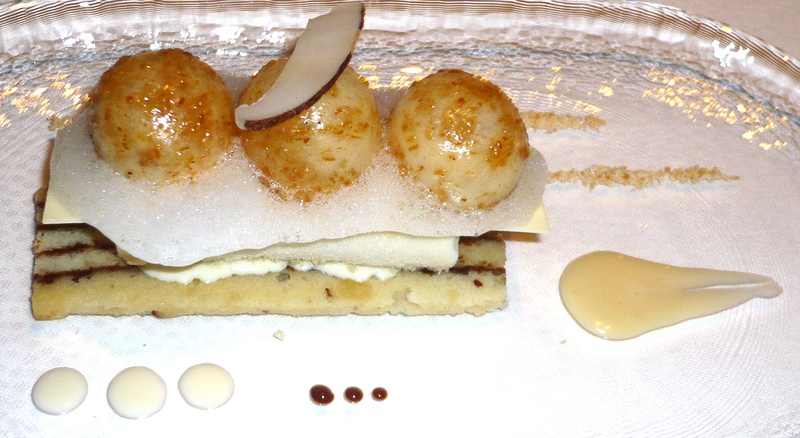 The Raffaello 09 was near perfection – only the raffaello balls filled with almond creme were a bit too large too eat in one bite, but hey I have to find something to criticize;-) The balls rested on a cocos ice cream and an almond financier. All-in-all an excellent interpretation of a ‘German’ candy (in fact without chocolate as the ads say). The sweet finale consisted of several sweet knusperillos and spoons – my absolute favorite was the Frankfurter Kranz in the middle as my Grandma used to make this cake for my birthdays and it was wonderful every time. For me a very special moment. 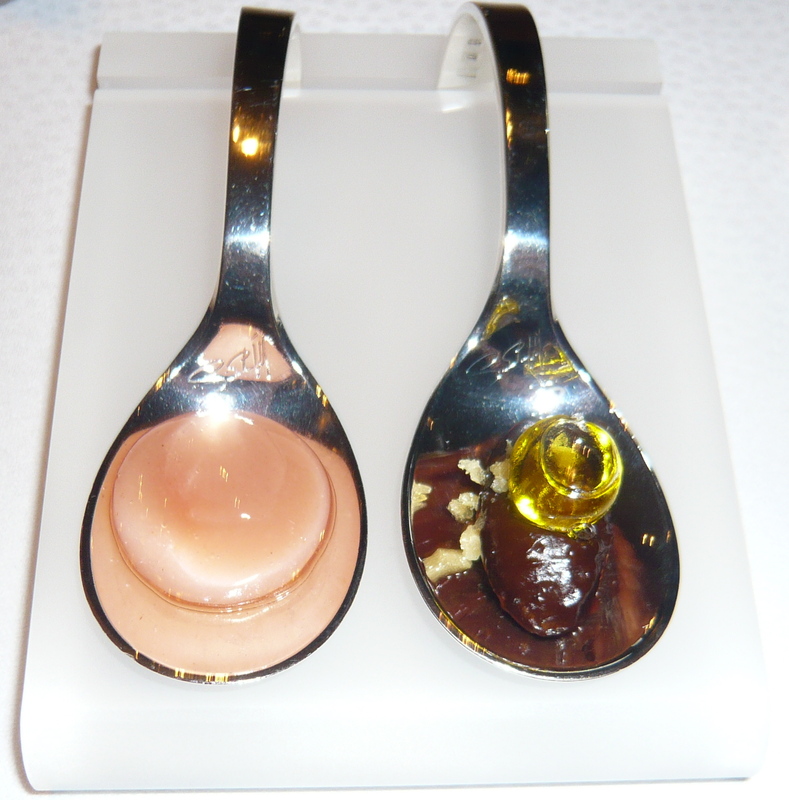 Also remarkable was the olive oil toffee (second to the left) which included encapsulated oil in a small sugar bowl – what love to the detail which pays off as the oil literally burst in your mouth together with a crunch. The last part, Milky Way is another famous candy bar which is advertised like “so light that it even swims in milk”. 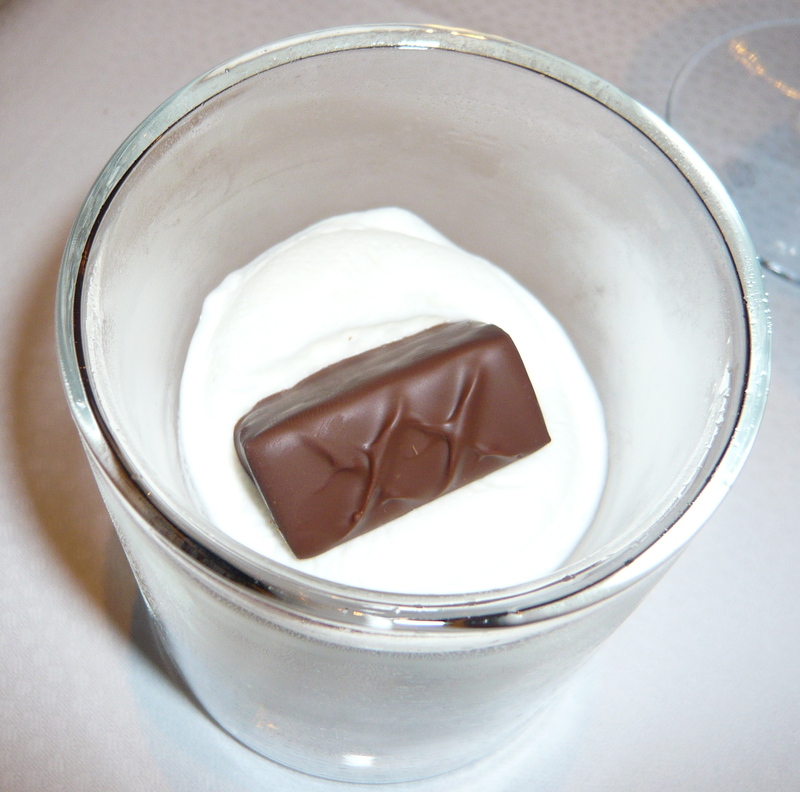 So here, this is visualised with the candy bar thrones on an milk espuma. A witty and crowning finale! No single dish below excellent, some even outstanding – there are not many meals in my life which I recall at that quality, surprising effects and, most importantly, the modification of familiar taste experiences. 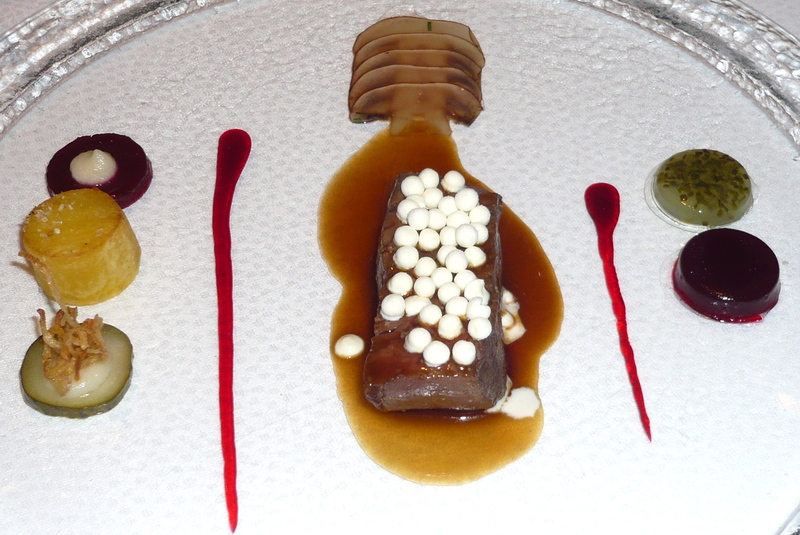 The latter makes Sven Elverfeld’s cuisine truly special and unique: it augments the dining experience by including your mind, your memories and your imagination. In a way similar to what Grant Achatz does with his appeal to our expectations it really creates a body & soul experience. 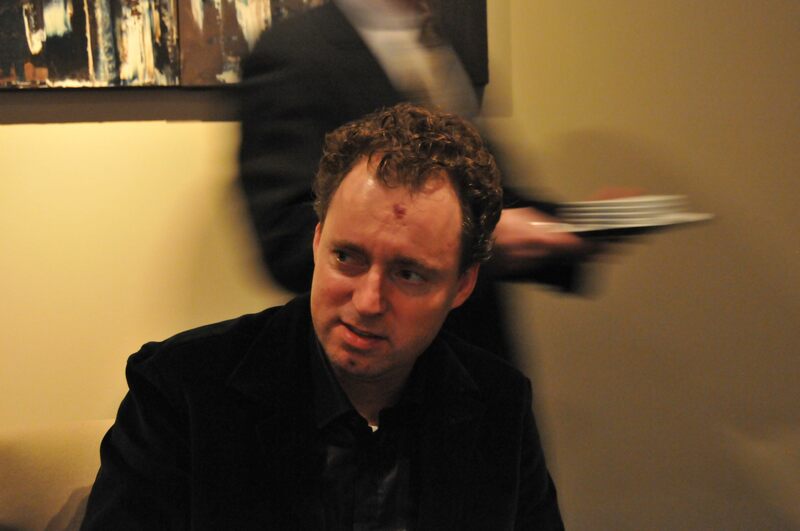 Compared to November 2007 Sven Elverfeld has developed quite significantly: his creations being more mature, the overall level of cooking being flawless and, most importantly, the cuisine less characterized by a quest for harmony. Now, there are some more rough edges as the surprising elements are more punctuated like the frozen sour cream and the tiny bacon bites. So in a way it became even more intellectually appealing without overburdening the diner. It’s like being taken by the hand by Sven Elverfeld and being shown his world of cooking. Yes, its is structuralistic but that’s what many others do as well – it’s more his touch for flavours and the playful interpretation of classics what makes it so special. Service is excellent, warm and receptive, very much too the point and never superimposed but of natural friendliness. Charming mâitre Jimmy Ledemazel makes you feel at home and is a benchmark of a host and mâitre. A big thank you to the whole brigade! 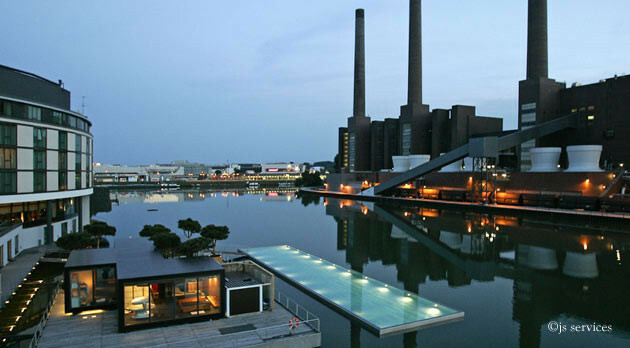 Well, Wolfsburg is not the centre of the world but for any foodie this is a must-go – and you can take stroll around in the Autostadt, the VW ‘museum’ on the past and future of automobiles,visit the Phæno museum or watch a soccer game of one the finest teams in the Bundesliga, VFL Wolfsburg. A must – I will be back soon! This entry was posted in Aqua, Europe, Germany - Fine Dining and tagged Aqua, Germany, Germany - Fine Dining, Jimmy Ledemazel, Jürgen Giesel, Sven Elverfeld, Three Star Michelin, Wolfsburg by IFS. Bookmark the permalink. Bravo Sven Elverfeld & Team ! Respect ! Seems like a highly interesting, unique meal there. Will have to go someday. Felix, it really is – not to be compared to anything else, a lot of ‘German’ elements modernized – I truly love it! Isn’t the Champagne créme sorbet another Dieter Mueller reference? 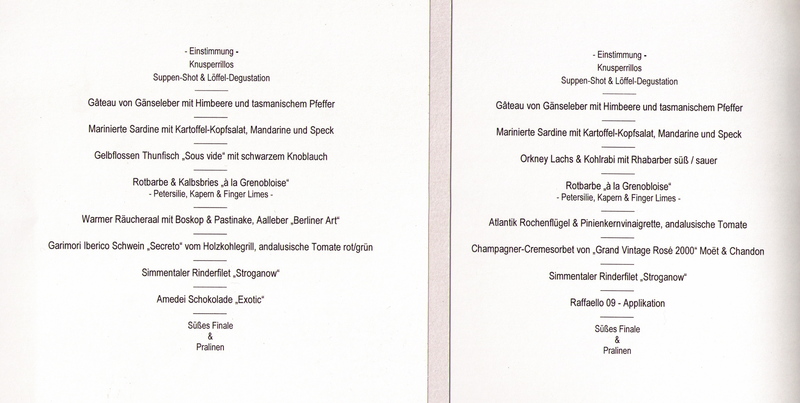 It does all look very good and nice to see the variety in styles among the top chefs in Germany. Hi, I absolutely agree on your report. You might check my review on my site: http://troisetoiles.de/2010/02/13/aqua-werkskantine-2-0 (it’s in German though) ;). If you don’t mind, I’d like to link to your excellent blog as well.